An initial estimate of a dairy’s risk of flooding can be made by reviewing the property’s history and using FEMA’s flood mapping program. Even a short one-page, all-hazards disaster plan developed before the rainy season can help streamline emergency operations should a crisis develop. Other precautions producers in flood prone areas can take include making provisions for emergency power, securing critical health records and bolstering vaccination protection, particularly for pastured animals. 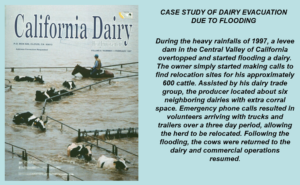 A dairy-specific emergency flood evacuation action list, reviewed by the California Department of Food and Agriculture, is available. 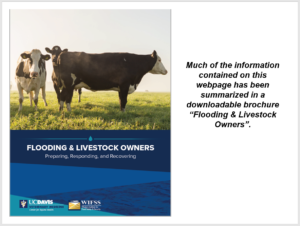 Much of the information contained on this webpage has been summarized in a downloadable brochure “Flooding & Livestock Owners”. California periodically experiences persistent, heavy rainfall, often accompanied by emergency reservoir releases which can place unusual strain on the State’s containment system. Some dairies in low-lying areas may be faced with partial or total facility inundation from flooded rivers, levee overtopping or levee failure. This webpage describes actions dairy owners can take to prepare, respond, and recover from flooding events. Know Your Floodplain: Use the property’s history and FEMA mapping to determine if your livestock’s housing or pastures will likely be affected by the flooding. Flood maps can also be used to determine which evacuation routes are likely to remain open. One quick, easy resource to help determine what your flood risk is the FEMA Flood Map Service Center. Simply enter your address and click “Search” and then the “View Web Map” button when it appears. It may take a few moments for the map to fully download. The example below shows a typical result, with the blue shading indicating an area having a 1% (1-in-100-chance) of flooding every year. This area is sometimes referred to (inaccurately) as a “100-year” flood plain and is equivalent to a 26% chance of experiencing flooding during a 30-year mortgage period. The FEMA flood map does not tell you how severe the flooding might be; for example, whether the water will be one foot or six feet deep. Neither does the map give information about what the speed of the current of the floodwaters will be. While generally useful the FEMA maps do not depict areas that could be flooded in the event of a dam or levee failure. Therefore, even producers residing in areas not normally considered a floodplain can still be threatened in severe storm events. 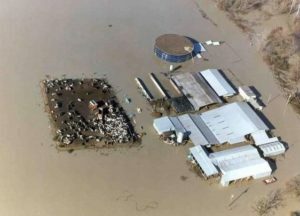 Create Your Own Flood Disaster Plan: The plan should include details for either evacuating your livestock or implementing “shelter-in-place.” Evacuation destinations frequently used are county fairgrounds, local auction barns, and nearby ranches or dairies located at a higher elevation. 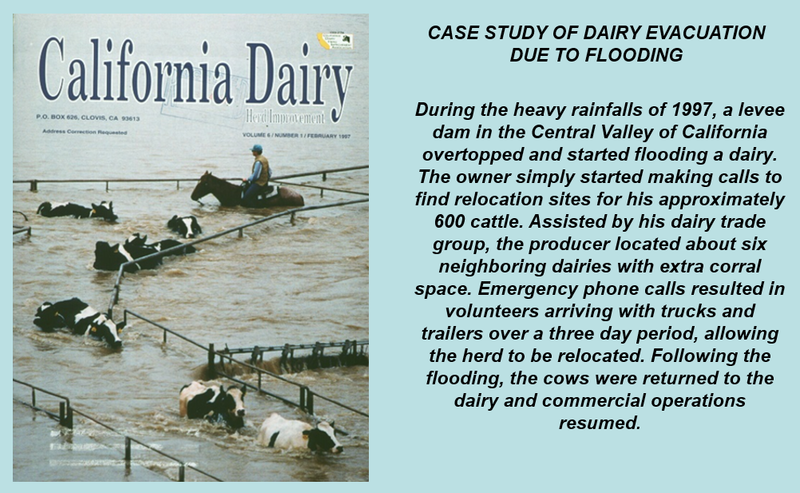 Your county’s Office of Emergency Management or local livestock organizations may be used to coordinate transportation and sheltering resources (see the dairy evacuation “Case Study” below). A quick one-page, all-hazards template plan from CDQAP can serve as a start, which you can modify as your emergency preparations evolve. Ensure Access to Emergency Information: Make provisions to monitor flood and weather conditions that don’t depend on grid electricity. Accurate news sources may include your county’s Office of Emergency Management websites and NOAA radio broadcasts. Improve Your Facility’s Flood Resistance: Improve storm drainage to limit inundation of critical areas. When possible store feed, seed grain, fertilizer, pesticides, and other commodities at higher locations. Elevate furnace, water heater, and electrical panels if they are susceptible to flooding. Some Washington State and Oregon dairy farms created elevated pads to more easily allow cattle to shelter-in-place. Secure Critical Records: Have copies of important legal, financial, and breeding records in a waterproof and fireproof box that is readily available during an evacuation. A better solution is to keep digital copies stored on a secure cloud-based server. Include photographs and video of insured property for later claims. Use Vaccination: Your veterinarian may recommend vaccination of pastured animals against diseases associated with flood-prone areas such as blackleg, anthrax, leptospirosis. Make Provision for Emergency Power: Have well-maintained backup generators for critical livestock production operations, like automatic waterers and feeders, fans, and milking equipment. In order to make sure the generator will work during an emergency it should be tested under a load every month. Prior to an anticipated event some producers will run a generator for an entire milking as a final test. 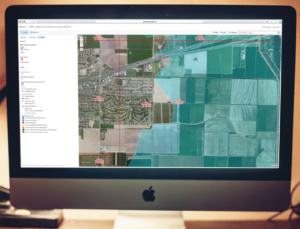 Monitor the Flood Conditions: Monitor watercourses, dams, and public and private levees which could threaten your facility. Orders of mandatory evacuation, emergency dam releases, or reports of levee overtopping, boils, or failure should trigger implementation of part or all of your Farm Disaster Plan. Protect Consumables: Protect animal drugs, fertilizers, pesticides, seeds, and feed, including hay and grain. This can mean repositioning to locations or buildings with higher elevation or creating improvised barriers. Relocate Heavy Equipment: Valuable mobile equipment such as tractors, farm trucks, and all-terrain vehicles should be relocated to higher ground. Shut Off Utilities: If significant flooding is expected, turn off utilities, turn off electrical breakers, and shut off propane at the tank. Identify an Evacuation Manager: Emergency evacuation of a dairy is an urgent, complex process, requiring that multiple tasks to be completed simultaneously by many people. Evacuation is more likely to be successful when a single evacuation manager is monitoring and coordinating the efforts of employees assigned to various specific tasks. Communication is key. Identify a Relocation Site: Ideally producers will have already discussed moving lactating cows to another family or neighbor’s dairy, allowing for uninterrupted milking. Space availability may require that more than one relocation site be used. 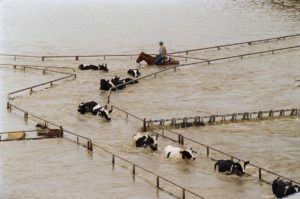 In flooding events in 1997 and 2017, processors and trade groups were able to assist producers by locating willing host dairies and vacant facilities. County fairgrounds, sales-barns and feedlots have been used as a last resort if facilities with milking equipment are not available. Record Number of Cows in Each Shipment – The trailer driver and a dairy employee of the host facility should agree on the number of cows being received in each shipment. Separate Evacuated Cows from Resident Cows – Evacuated cows should be kept in pens separate from resident cows. Ensure that evacuated cows can be individually distinguished from cows on the host dairy; cow identification might be unique (different color ear tags) but marking chalk can be used in a pinch. Visiting cows should be monitored daily and closely for signs of illness. Visiting Cows Should be Milked Separately – CDFA allows for the milk of visiting cows to be co-mingled with that of resident cows. Visiting cows however should be milked last, after the resident cow strings, but before the hospital strings of both herds. Insure Evacuated Hospital Pen Cows are Isolated – To prevent residues it is critical treated cows from the evacuated farm not accidentally end up in a milking string. Agreement Between Evacuated and Host Dairy Managers – There should be an agreement between the evacuating producer and the host producers has to how to handle maintenance costs (feed, labor, medications) and milk remittance. A dairy trade group can assist in setting up an agreement. Identify Transportation Resources: In the past, processors and trade groups have helped organize sufficient trucks, trailers and manpower to move a threatened herd. Barring that, the County Agricultural Commissioner or County Emergency Services Coordinator may be able to access transportation resources during a declared local or state-wide emergency. Contact Your Milk Inspection Service: It is essential that producer’s inform their dairy inspector of the evacuation. If cows are being moved from one inspected dairy to another, no change will occur in Grade A permit status of either the evacuated herd or the host facility. If, however, a herd is evacuated to a vacant facility, local or state dairy inspectors will need to perform an emergency inspection to insure that all sanitation and hygiene requirements will be met. Prepare the Dairy for Inundation: Depending on how much warning has been given it may be possible to complete some preparations prior to evacuating the farm. Relocate heavy equipment such as trucks, tractors, ATVs which can be damaged by submersion. Shut off utilities: turn off electrical breakers and shut off propane at the tank. Leave building doors and windows open several inches to equalize pressure and help prevent buildings from shifting. Use heavy plastic sheeting and duct tape to seal off the well-head, preventing contamination of the farm’s well. Protect toxic and expensive consumable products (animal drugs, fertilizers, pesticides) and hay and grain, if possible. Protect Dairy Records: If the dairy’s records are not already backed up on a secure “cloud” server, you’ll want to download relevant financial, breeding, ration, production and medical files. Alternatively, you may simply choose to simply take the dairy’s computer with you. Document All Expenditures: If a local or national emergency is declared it is likely that relief grants or low-interest loans will become available. Receipts for any disaster-related expenders (from feed to fuel to hotel rooms) should be collected in a safe place. Contact the Regional Board: If flooding results in an off-site discharge of manure the General Order requires producers to notify their Regional Water Quality Control Board within 24 hours. CDQAP information sheets provide important regulatory compliance reminders for dairy producers located in the Central Valley and North Coast areas during winter rain events. Contact Your Milk Inspection Service: Before returning your cows, arrange for a dairy inspection. Contaminated equipment or otherwise unsanitary conditions could lead to a temporary loss of a permit to market milk. If there was potential well water contamination, the dairy inspector may elect to take water samples to ensure that water used for drinking, cooling and washing meet State standards. Perform an Initial Survey: If animals were sheltered-in-place, ensure that all animals are accounted for and are eating. Use a camera or cell phone to take photographs and video footage of damage and losses for insurance claims submission. Survey Feed Damage: Check all sources of feeds and pasture forages for spoiling and contamination. Standing water may have ruined some pasture forage, forcing isolated animals to consume contaminated forages or even poisonous plants. Pay particular attention to stored feed and forages, looking for molds, which can both sicken animals and make their products, such as meat and milk, unsafe for human consumption. While guidance is available on how to salvage wet feed, it is frequently logistically not practical. Water damaged hay which will not be fed and is awaiting disposal should be monitored as a potential source of hay fires. Protect Against Animal Disease: Develop a post-flood preventative herd health plan with your herd veterinarian. This could potentially include vaccination against diseases associated with flood-prone areas such as Blackleg, anthrax, or leptospirosis, treatment for worms and liver flukes in pastured cattle and an expanded mastitis monitoring program. Watch for Disaster Relief Grants: Following declared disasters, state and federal governments may offer disaster relief grants or low-interest loans. For agriculture and animal operations, this assistance is typically managed either through USDA’s Natural Resources Conservation Service (NRCS) or its Farm Services Agency (FSA). Important deadline windows for applying may be narrow and documentation of losses and expenditures is essential.